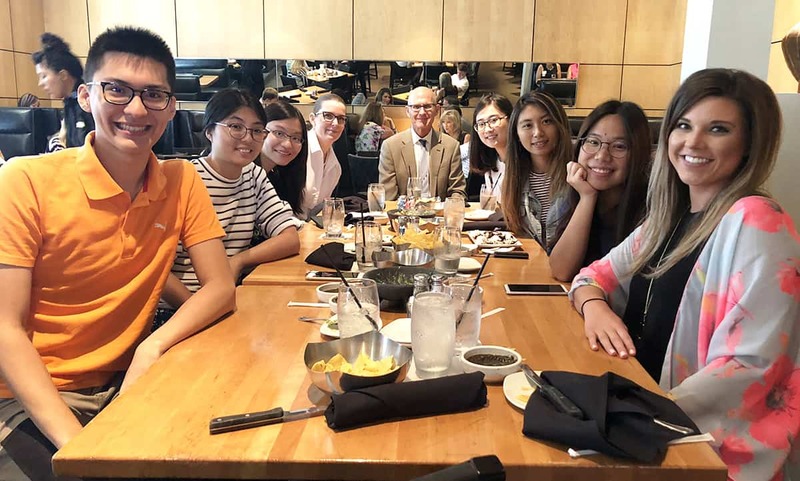 College of Pharmacy Dean Keith Olsen, Pharm.D., center, and guests get ready to share a meal with the six pharmacy students from Kaohsiung Medical University in this year's student exchange. Sept. 6, 2018 | Sept. 6, 2018 | The UAMS College of Nursing and College of Pharmacy welcomed nursing and pharmacy students from the Kaohsiung Medical University in Kaohsiung City, Taiwan, to campus in August for a four-week, study-abroad opportunity. This is the first time UAMS has hosted nursing students from KMU. Kaohsiung nursing and pharmacy students visit with the College of Nursing Canvas Foot Clinic’s volunteer staff. Kaohsiung Medical University welcomed UAMS nursing and pharmacy students in November 2017 and will host them again this fall. In 1980, then-UAMS Chancellor Harry Ward signed an exchange agreement between UAMS and Kaohsiung Medical University. The progam hadn’t been active for some time when several years ago, Kaohsiung College of Pharmacy officials got in touch with their counterparts here about activating the program. The first students from UAMS made the journey to Taiwan in the summer of 2012. 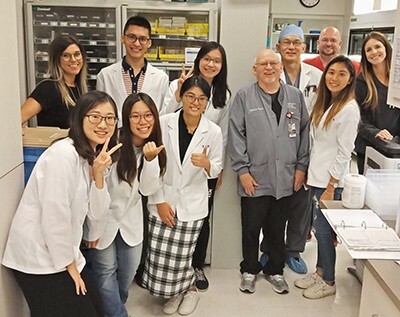 The regular exchange between the College of Pharmacy and Kaohsiung now involves six students from Kaohsiung coming here each August and six students from UAMS going there each fall. This year’s exchange was the first to include nursing students. After receiving a warning about extreme weather in Arkansas, most of the Taiwanese students were just happy to disembark into a climate they found to be less hot and humid than their home. The friendly people and four-week agenda filled with learning opportunities and sightseeing was an added bonus. 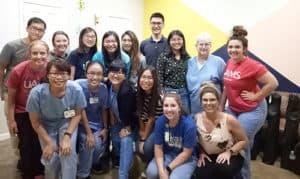 The nursing students, including Yi-shun, Te-Meng and Yun-Shun, got extensive time in interprofessional workshops, clinics, boot camps and simulations to receive a crash course in health care in the U.S. They also learned about programs available at UAMS. Te-Meng said a few differences they encountered in the U.S. were shift allotments and nurse-patient ratios. In Taiwan a day is divided into three shifts where at UAMS they noticed two-shift days. Nurse-patient ratios are greater in Taiwan, she said. Te-Meng said she was interested in master’s and doctorate programs offered in the states and was encouraged by faculty and staff to pursue them if she returned to the U.S. after completing her four-year training in Taiwan. The impact from the students’ month-long stay was not only felt by the students, but also by the faculty and staff with them. The pharmacy students from Kaohsiung tour a pharmacy during their visit. Seth Heldenbrand, Pharm.D., associate professor and associate dean of Experiential Education, said it took some persuading to convince pharmacy professors at Kaohsiung that interprofessional education was effective, but the pharmacy students in the exchange took to it immediately. Henry Su, a third-year pharmacy student at Kaohsiung, said he saw the value during an interprofessional roleplaying exercise in the Simulation Center. Along with the five other pharmacy students in the exchange, Su toured community and hospital pharmacies, played a roleplaying game designed to teach geriatric pharmacy and sat in on classes. The students were especially struck by the more active role pharmacists are allowed in patient care than in Taiwan, like administering flu shots. Peggy Chin, a fourth-year pharmacy student in the exchange, said she came to UAMS to see how pharmacies here make use of technology and was impressed how medication management software and other innovations not only make processes more efficient but improve the patient experience.